At its simplest, you could have just a landing page, or a 'one-page promo' like Spotify's annual 'best-of' playlist pages that connects to ample existing content elsewhere via a vital signup link. That probably took the marketing team and one developer a couple of days to put together and most of that would have been selecting the images for the page. Or there's Ford Motors' Sustainability Report 2016-17, which is a 'micro' site relative to the Ford main site, albeit fifty or sixty pages-worth of glossy content designed to prove Ford's environmental credentials. If you're Ford, you can assign an entire web development team for as long as it needs to keep the environmental lobby calm. When management says you've a commission for a government department for an educational micro-site and 'it's fine, we're re-purposing a lot of existing material' you buckle up for a full development cycle, because it's never that simple. Content is king, expectations are high and it's a flagship project which could generate further commissions. But it's still a micro-site. The site map comes in; sixteen topics, tools case studies, exercises, a resource library, trainer-the-trainer resources, media library and the usual terms/policy pages. So you'll need a full site search. But it's still a micro-site. As the content development progresses, it becomes clear that each of the topic pages needs to be tabbed for the content structure to be easily navigated, so your 16 topics are effectively four pages each. There'll be several rounds of content revision, everything cross-links to everything else (that's the beauty of HTML page) and you'll need that broken link checker. But it's still a micro-site. Solution: a lot of overtime. That went so well, the next commission comes in with even more content pages covering legal procedures and documents and a further library of video resources. And this time the content pages need a summary/index section and five content sections - with long titles - which means switching to accordion controls to get six pages into one. But it's still a micro-site. As we got into later micro-sites, the focus grew narrower, the site maps got smaller, the presentation got slicker and we got back to something more recognisably micro-site-ish (not really a term). Usually the problem with micro-sites that aren't tied to a time-limited product or promotion is they grow and spread and turn into... macro sites (also not a term, so don't try to use it, you'll sound like an idiot). As was pointed out at the time, ours were never very micro; despite passing those two key criteria, focus and audience, there was always' too much' content to consider them micro. 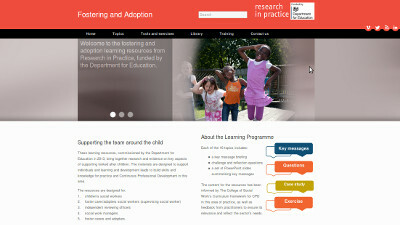 As fully-fledged, high-quality educational resources, we were very proud of them.